Brooklyn, 1922, and a young Gavin Daly is woken by a drunken gang of men who murder his mother and drag away his father, who is never seen again. On the dockside, waiting to board a liner that will take Gavin and his sister, Aileen, to live in Ireland with his aunt, he is given his father’s watch with an instruction to ‘watch the numbers’ and he vows to discover what happened to his father. Fast forward to 2013 and Daly is aged 95 and has become a rich man through the antiques trade, but has never discovered his father’s fate. The watch is entrusted to Aileen and is locked in a safe. When Aileen is found trussed to a radiator and tortured, her house cleared of its valuables, including her father’s watch, Detective Superintendent Roy Grace takes charge of the investigation. Having just become a father, Grace is suffering from a ‘baby head’ and guilt at not spending as much time at home as he’d like. Livid at the death of his sister and the loss of his father’s watch, Daly starts his own parallel investigation using his wealth and contacts in the antiques trade to try and track down the culprits. Slowly both investigations make headway, but Daly is one step ahead and he has notions of delivering a different kind of justice to that of Grace. In the meantime, one of Grace’s old collars, Amis Smallbone, wants to exact revenge for twelve years in prison. 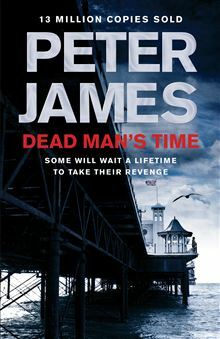 It’s been quite a while since I read a Peter James novel, so I was quite happy to receive an ARC of Dead Man’s Time, the ninth in the Roy Grace series. 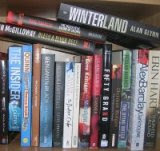 On the plus side, it’s an enjoyable enough read, with a fairly complex plot that weaves an interesting tale. James clearly knows his police procedures and the cop side of the story has the feel of authenticity. The family and criminal sides of the story, however, felt uneven and overly contrived. The whole Amis Smallbone subplot, for example, was unconvincing. Whereas Grace, his partner and some of his colleagues were three-dimensional and engaging, many of the characters were flat and caricaturish. The tale is told through workmanlike prose, and despite each chapter only being a couple of pages long there were too many redundant passages and repetition. Overall, then, a reasonably entertaining tale, with a nice twist at the end, but somewhat uneven in its telling.